Should you invest in Product, Sales, or Marketing? When someone calls you to discuss a product you just signed up for, how do you feel? 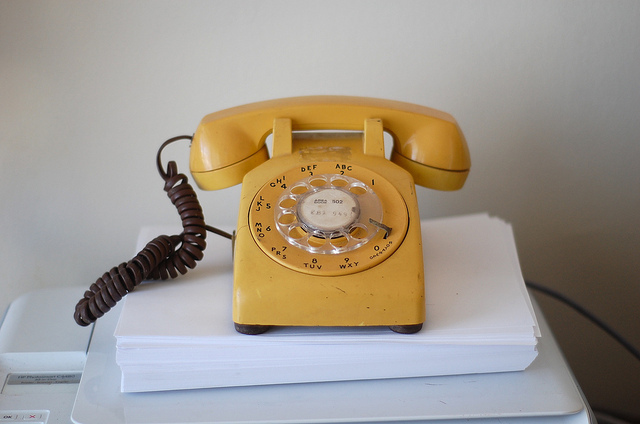 Depending upon where you are in your buyer’s journey, you might welcome the call, feel ambivalent, or be annoyed that the company called you at all (especially if you haven’t yet given them your phone number). What often happens is a mismatch between the relationship strength — the relationship between you and the company necessary for you to have a good experience with their product — and your goals. Likewise, the transaction cost — the effort required for you to experience the product enough to know whether you’re ready to buy — may also be fundamentally misplaced. A great (first time or otherwise) product experience matches the relationship strength needed by the typical customer. How much help will the customer need from you to get what they need from your product? This product experience also matches the transaction cost that customer expects. Is it too much work for the customer to do the work they need to do, with or without your help? Answering these two questions helps you scope your investment in your product to focus on sales, marketing, or product efforts. Is the relationship effort and cost needed small — like when you try a free product that might not bring you immediate benefit — or is it quite high? You might be auditioning to solve a pivotal problem for a large business while working on a deadline. As a marketer and seller of product, you need different resources to be effective depending upon the relationship strength and transaction cost required by your product. Some products have a low transaction cost, and others do not; likewise, some products require a lot of relationship support and others use low- or no-touch sales. An example of a low transaction cost and low relationship strength product is a single-use course or a downloadable product. The most you will lose on this sale as a customer is a one-time spend, probably for a relatively low dollar amount. The key to selling a product like this is to show the customer the substitute (likely not buying) and the outsized benefit your product delivers (e.g. buy my product and it will pay itself back 10-fold). 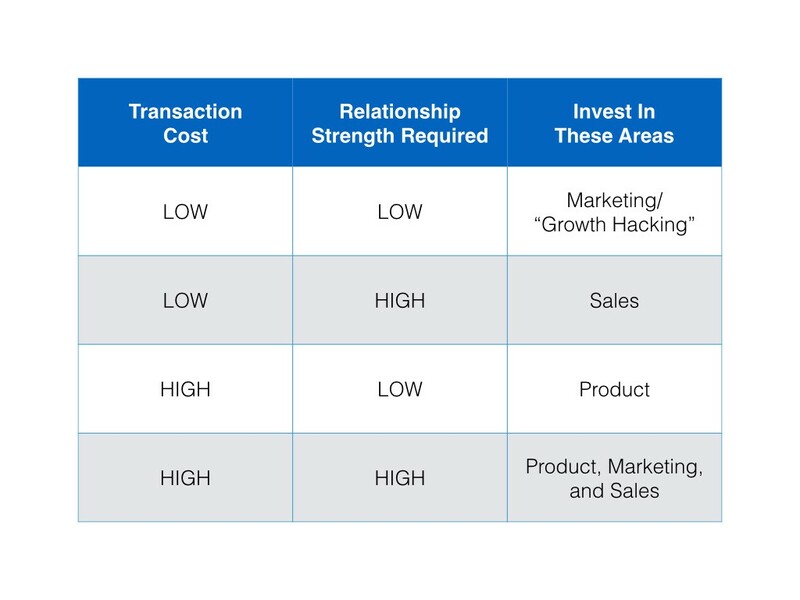 Selling a low transaction cost/low relationship strength product depends on “growth-hacking” (or old-fashioned direct marketing, if you prefer to call it that). If the product turns out not to work, then there is only the sunk cost of the single purchase to consider. Happy customers also don’t need salespeople to help them spread the word about this product — the recommendation to others is itself part of the marketing strategy — and reinforces the perception that the product works. To excel at low transaction cost / low relationship strength products you should invest first in marketing. Bringing people to the door is the key item for your success. When you have a product with a Low transaction cost (free*) and a high relationship strength required, there is another kind of sale that needs to happen. Selling a product with a free trial has multiple components, including the the experience of the product during the trial and the skill necessary for the sales effort to match the customer’s need. There are many products in this category that use a “no-touch” or “low-touch” sales method. However the sales effort is critical to moving the customer from a low transaction cost (try my product) to the ongoing effort needed to stay engaged with that product. The high relationship strength here refers to the customer success effort required to get the customer from the starting line and end up as an everyday part of their toolkit. Successful businesses who make the trial about the customer and then build value through a great product are successful at keeping the customer for the long haul. Short-term sales efforts to bring the customer in regardless of what they need only add to net churn. To do better at selling a freemium product or a free-trial product, you’ll need to invest in sales process, and then progressively in product as your base of customers asks for and demands new features to keep your product relevant. To excel in selling low transaction cost / high relationship strength products you should invest first in Sales. Everything your customer needs is probably already there, and they need your help to find it. This category is tricky because sooner rather than later you will need to invest in Product as well, so balancing that give-and-take is a constant struggle. There are other products that have a very low relationship strength required, and a relatively high transaction cost to become truly engaged. These products are dependent upon product features and functionality to produce a good result. Two of these are Facebook and Twitter. (Huh?) You might confuse some of these products with low transaction cost / low relationship strength required versions, because they’re free and you never have to talk to a salesperson. Yet both Facebook and Twitter ask you to funnel all of your voice, data, and browsing connections through them and to mine all of your data. The transaction cost — though high — is hidden because you don’t know exactly what they’re doing to monetize your actions. Products like Twitter and Facebook produce really large audiences if they are done right. They are unicorns, and should be referred to as such because the product experience required to exact this everyday transaction cost is very hard. Over time the relationship strength built by the everyday interaction is even higher than other methods because we use these platforms many times a day. Making the product simple enough to use and providing a benefit reinforced by other customers is hard. An alternate way to approach a market like this is to create a an extremely focused, well-crafted product for a single thing. Finally there is the platform sale — it has high transaction cost (you don’t even know what is until you are well into the evaluation cycle) and high relationship strength required (a team of people are your shepherd in the buying process). When success in the product entails learning about the existence of the product, understanding why you need to use it, training and costs to get you up to speed, and salespeople to adequately size what you need, you can see why it might be expensive. Examples of the platform sales include the typical Enterprise Product Sale, which may include an Account Executive, an Implementation Specialist, and a Support Team to launch your implementation. As the dollars invested become bigger each one of those functions may look like a team. Building an enterprise sales team that overcomes the issues of high transaction cost and high relationship strength requires investment in Sales, Marketing, and Product. And those three really need to work together to deliver the kind of experience Enterprise buyers want. Examples of these products include customized offerings from many high-end software companies, including Salesforce, Microsoft, IBM, and Oracle. Can a Product Sale Move Between Types? Often when you are talking to a buyer it might not be immediately evident what they are seeking. The buyer may seek out a vendor who sells one kind of service hoping for 80% of the functionality of a more expensive service because they want to save money. Or they may ask the high-end vendor for functionality that isn’t invented yet because what they really want is simply to be told what they should do. Matching the right buyer to the right product offering helps you know where to invest and what focus to build with your team, whether it’s Sales, Marketing, Product, or all three at the same time.